Eugen Weidmann (February 5, 1908 – June 17, 1939) was a German criminal and serial murderer who was executed by guillotine in France in June 1939, the last public execution in that country. (Executions by guillotine continued in private until Hamida Djandoubi‘s execution on September 10, 1977). Weidmann was born in Frankfurt am Main in Germany to the family of an export businessman, and went to school there. He was sent to live with his grandparents at the outbreak of World War I; during this time he started stealing. Later in his twenties he served five years in Saarbrücken jail for robbery. Their first kidnap attempt ended in failure because their victim struggled too hard, forcing them to let him go. In July 1937, they made a second attempt, Weidmann having made the acquaintance of Jean De Koven, a 22-year-old New York City dancer visiting her aunt Ida Sackheim in Paris. During their meeting they smoked and “Siegfried” gave her a glass of milk. She took photos of him with her new camera (later found beside her body, the developed snapshots showing her killer). Weidmann then strangled and buried her in the villa’s garden. She had 300 francs in cash and $430 in traveller’s cheques, which the group sent Million’s mistress, Colette Tricot, to cash. Sackheim received a letter demanding $500 for the return of her niece. De Koven’s brother Henry later came to France offering a 10,000 franc reward from his father Abraham for information about the young woman. On September 1 of the same year, Weidmann hired a chauffeur named Joseph Couffy to drive him to the French Riviera where, in a forest outside Tours he shot him in the nape of the neck and stole his car and 2500 francs. The next murder came on September 3, after Weidmann and Million lured Janine Keller, a private nurse, into a cave in the forest of Fontainebleau with a job offer. There he killed her, again with a bullet to the nape of the neck, before robbing her of 1400 francs and her diamond ring. On October 16, Million and Weidmann arranged a meeting with a young theatrical producer named Roger LeBlond, promising to invest money in one of his shows. Instead, Weidmann shot him in the back of his head and took his wallet containing 5000 francs. On November 22, Weidmann murdered and robbed Fritz Frommer, a young German he had met in jail. Frommer, a Jew, had been held there for his anti-Nazi views. Once again the victim was shot in the nape of the neck. His body was buried in the basement of the Saint-Cloud house where De Koven was interred. 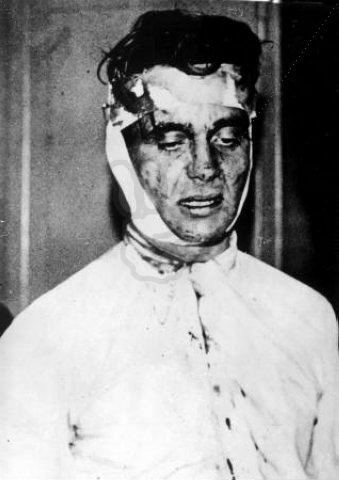 Five days later Weidmann committed his final murder. Raymond Lesobre, a real estate agent, was shot in the killer’s preferred fashion while showing him around a house in Saint-Cloud. Five thousand francs were taken from him. Officers from the Sûreté, led by a young inspector named Primborgne, eventually tracked Weidmann to the villa from a business card left at Lesobre’s office. Arriving at his home, Weidmann found two officers waiting for him. Inviting them in, he then turned and fired three times at them with a pistol. Although they were unarmed, the wounded Sûreté men managed to wrestle Weidmann down, knocking him unconscious with a hammer that happened to be nearby. 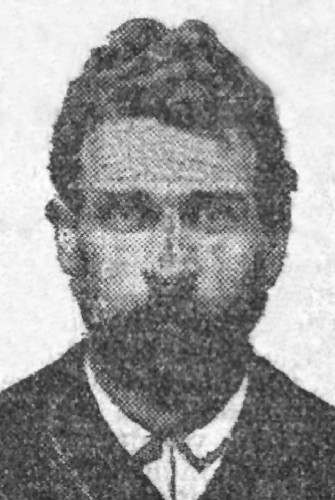 The murder trial of Weidmann, Million, Blanc and Tricot in Versailles in March 1939 was the biggest since that of Henri Désiré Landru, the modern-day “Bluebeard“, 18 years earlier. One of Weidmann’s lawyers, Vincent de Moro-Giafferi, had indeed defended Landru. Also present was the French novelist Colette, who was engaged by Paris-Soir to write an essay on Weidmann. Weidmann and Million received the death sentence while Blanc received a jail sentence of twenty months and Tricot was acquitted. Million’s sentence was later commuted to life imprisonment. 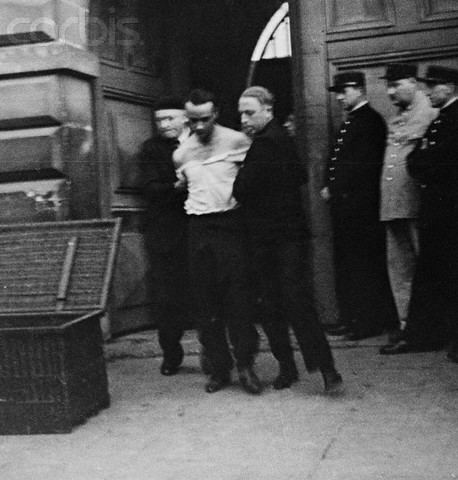 On June 17, 1939, Weidmann was beheaded outside the prison Saint-Pierre in Versailles. The “hysterical behaviour” by spectators was so scandalous that French president Albert Lebrun immediately banned all future public executions. Unknown to authorities, film of the execution was shot from a private apartment adjacent to the prison. British actor Christopher Lee – who was 17 at the time – witnessed the event. He would later go on to play headsman Charles-Henri Sanson in a French TV drama about the French Revolution, in which his character made prolific use of the device. Comments On Cain by F. Tennyson Jesse (New York: Collier Books; London: Collier-Macmillan, Ltd., 1948, 1964), 158p., p. 99–158, “Eugen Weidmann: A Study in Brouhaha”. There is a drawing of Weidmann as the frontispiece of the book. A guillotine is an apparatus designed for efficiently carrying out executions by beheading. The device consists of a tall, upright frame in which a weighted and angled blade is raised to the top and suspended. The condemned person is secured with stocks at the bottom of the frame, positioning the neck directly below the blade. The blade is then released, to quickly fall and forcefully decapitate the victim with a single, clean pass so that the head falls into a basket below. The question of consciousness following decapitation remained a topic of discussion during the guillotine’s use. I waited for several seconds. The spasmodic movements ceased. […] It was then that I called in a strong, sharp voice: “Languille!” I saw the eyelids slowly lift up, without any spasmodic contractions – I insist advisedly on this peculiarity – but with an even movement, quite distinct and normal, such as happens in everyday life, with people awakened or torn from their thoughts. Next Languille’s eyes very definitely fixed themselves on mine and the pupils focused themselves. I was not, then, dealing with the sort of vague dull look without any expression, that can be observed any day in dying people to whom one speaks: I was dealing with undeniably living eyes which were looking at me. After several seconds, the eyelids closed again […].